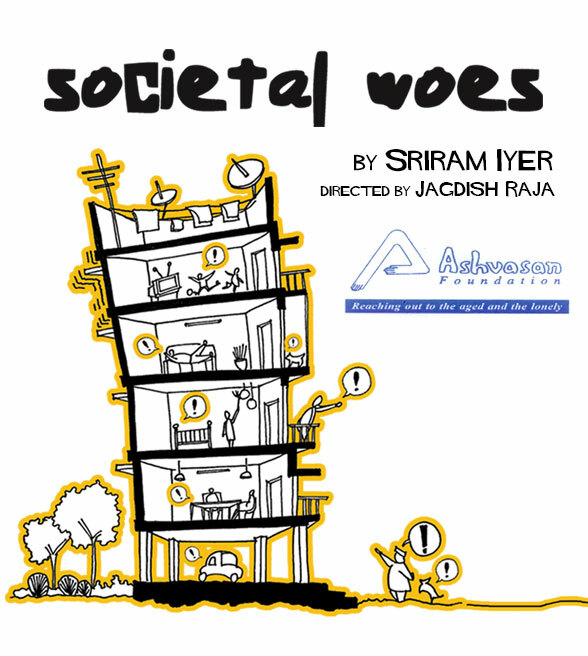 Ashvasan Foundation presents SOCIETAL WOES by Sriram Iyer and directed by Jagdish Raja. Ashvasan Foundation, a voluntary service organization, was started in 1993 to reach out to the senior citizens, the aged and the lonely. The foundation strives to provide them with leisure activities, companionship, seminars, food, clothing or medical assistance. Today, six centres of Ashvasan, at Vasanth Nagar, Sampangiram Nagar, Koramangala, Indiranagar, Malleswaram and Jalavayu Vihar. Members of Ashvasan with close proximity to a centre meet once a month and partake in programmes that deal with issues like health, yoga, safety and security, financial investments, travelogues and topical subjects like current affairs, entertainment in music, dance & humour. Birthdays and anniversaries of members are celebrated. The Ashvasan Foundation has grown from strength to strength since its inception, touching the lives of hundreds and thousands of senior citizens in the city. Be it by providing them with leisure activities, companionship, seminars, food, clothing or medical assistance, Ashvasan strives to restore a sense of purpose in the lives of its senior members. Over the years Ashvasan has touched the lives of hundreds of senior citizens in Bangalore.